if you fancy taking part or can spare anything to donate). 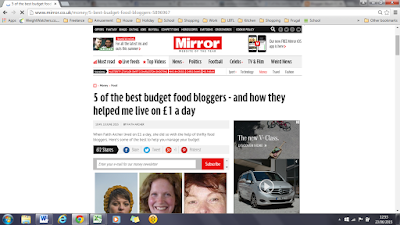 So last week I wrote an article for the Mirror website about five of my favourite budget food bloggers. Familiar names like Jack Monroe (aka A Girl Called Jack), Frugal Queen (no longer blogging, but available from WayBack) and Thrifty Lesley are fantastic sources of cheap recipes, and I mentioned Skint Dad for his fakeaway series. I also added Pat Parker’s friendly Facebook group: Feed Yourself for £1 a Day. It is always hard to cut a long list down to just five, and I did cheat by cramming in a few more links at the end of the piece (Penny’s Recipes, The Skint Foodie, North/South Food, Natural Kitchen Adventures). Many of the frugal living blogs include great recipes among a myriad of other useful advice, and I am sure there are many more excellent blogs that I haven’t stumbled across yet. just had limited parts relevant to Live Below the Line. house, vouchers, discounts, donations, prizes or the garden. This particular challenge is now finished, but fortunately Sue continues her normal blog at Our New Life in the Country and more recently A Challenging Year. 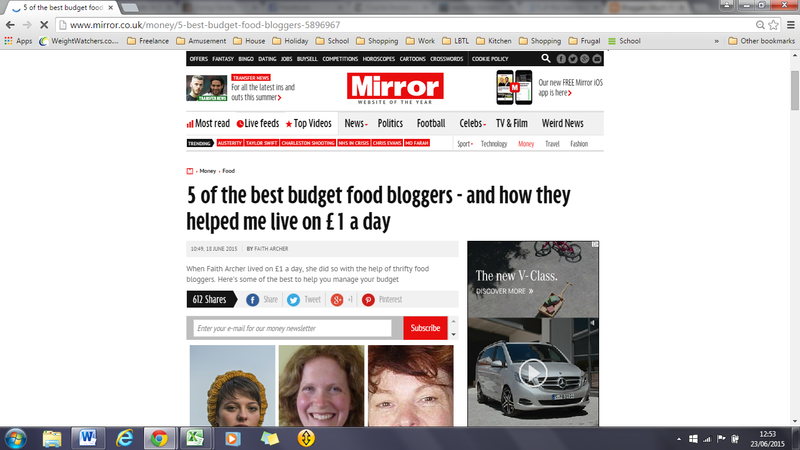 The author decided to spend January 2014 feeding himself on£1 a day, and describes it in his own unique way. Ever read The Rosie Project? It does remind me a bit of this blog. yellow-stickered sea bream. I’ve just seen there are even a couple of posts this year, so maybe he might be back! stretching a chicken and cooking with split peas and pearl barley. I only came across Yumsome after doing Live Below the Line, but her food looks delicious and the photos are beautiful. Which blogs do you turn to for inspiration on low cost but interesting food? I enjoyed my challenge, but didn't finish it off …I should have done. Maybe I'll do something similar in the future and actually try to see it through to the end. Personally I think it's amazing that you did your challenge for 211 days – I'm only on day 24 of eating down the cupboards, fridge and freezer and I'm already looking forward to food shopping without the need to justify and photograph the purchases! Has definitely helped cut down on food bills and wastage though.